Disclosure: I attended Sweet Suite 2013 as a guest, and received the items mentioned below for free. All opinions are my own. While away attending that event in Chicago that I've already told you a lot about, I was invited to attend Sweet Suite 2013, "The Biggest Night of Play!" party. Local Boston Parent Blogger Charlene of Charlene Chronicles was one of the co-hosts of the event, so I figured this would be a good way to test out some of my thinking on embracing sponsored content here at Busy Since Birth. There will be more to come on that in a future post, but first, it was time to play. 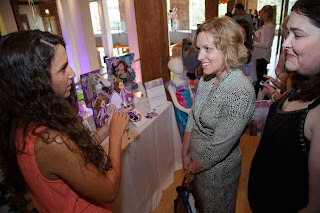 The event was in a lovely space, and brought together a huge number of toy companies promoting their latest items to the blogging public while offering some desserts and beverages. Kimberly and I went through the two-story space together, though I have to admit I hung back more while watching Kimberly make a lot of connections. In some ways, my kids have aged out of a lot of toys already, and so there were fewer companies I was interested in getting to know. In other ways, I was sad to see that my kids have missed out on some truly great toy enhancements over the past few years (three year old Hannah would have died for the light-up princess costumes, and there were so many kid-friendly tablets). I left the event with some great stuff from Fashion Angels and Peanuts, and an old school Spirograph. Then I was positively stunned to receive a giant box filled with even more toys at home a few days later. I let the kids each choose two items to keep, and the rest are being donated to a local charity called Cradles to Crayons--there were over 25 toys still left in the box! Hannah chose the latest Kidz Bop CD and a set of Pinypon characters, and Max chose a Teenage Mutant Ninja Turtle and a Tagamoto racing car kit. Everyone has been pleased with their selections. I had a great time exploring and playing. A full list of all the participants is below!